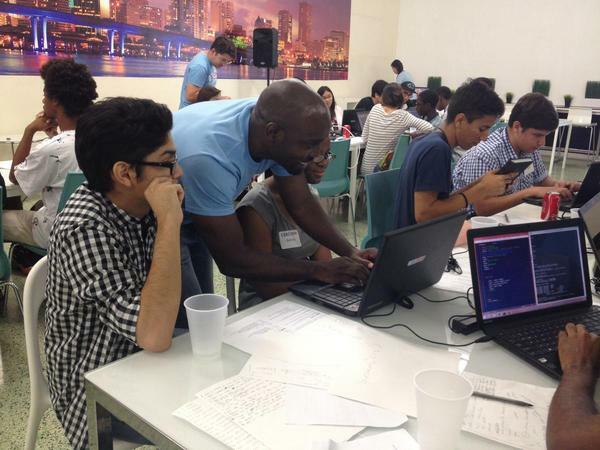 Instructor Kareem Green works with students at a "CodeNow" coding camp in Miami in June 2014. Projects at this Saturday's "National Day of Civic Hacking" will work on sea-level rise, transit and ocean pollution, says Susan Jacobson, an FIU professor and Code For Miami member. The list of Code Miami's previous projects includes an app called "Will It Flood?" To create it, programmers combined maps with tidal data from NOAA to provide users with a calendar that can help them avoid saltwater damage to their cars and the inevitable traffic headaches that come from inches or feet of water in the streets. "It gives you a heads up as to when the highest high tides are going to be in your neighborhood," Jacobson said. When: The Code For Miami "National Day of Civic Hacking" event takes place this Saturday from 9 a.m. to 5:30 p.m.
Where: 6th Floor Cafe at the Cambridge Innovation Center, 1951 NW 7th Ave., Miami, FL 33136. It's free, but to participate you have to register here.